Arazá! What a wonderful name! Too bad the fruit is so tart…. But Farmer Margie told me that Hani Khouri of Redland Mediterranean Organics was going to make ice cream with it. Robert Barnum confirmed he had sold some fruit. Hot on the trail, I spoke with Hani and he promised that arazá ice cream would be available at the Edible Garden Festival at Fairchild Tropical Botanic Garden. So I braved sporadic rain showers on Saturday, sidled up to Hani’s tent and asked, “Got arazá?” Yes, he said, and his son Jad handed me a container from the cooler. The only ingredients are arazá, agave nectar, and fresh goat milk. 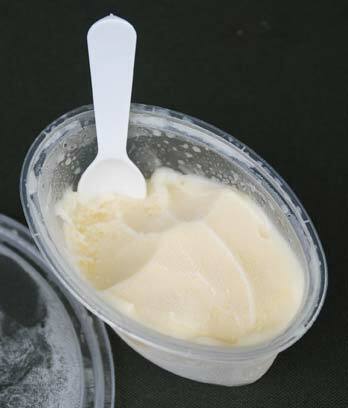 The ice cream is pale yellow in color, sweet and tart at the same time, with a “yogurt-like flavor in the back as a finish,” as Hani described. From the first spoonful I was in a swoon, lost in the blend of sweet-tart-tangy flavors and the smooth, creamy texture. Almost forgot to photograph it, that’s why there’s some missing in the picture. It’s now my new favorite flavor. Sorry, mango-orchid. Sorry, papaya. Hani started heating organic safflower oil in the big fry pan to make falafel, and I realized that a) I hadn’t had lunch and b) I hadn’t eaten his falafel in ages. Time to remedy that. First came the flatbread, smeared with a dab of tahini sauce green with mint. Then three golden nuggets of falafel were topped with amba, fermented pickled green mango flavored with fenugreek and mustard seeds. “It’s spicy,” Hani warned, adding a small amount. (He claims that Farmers Margie and Gabriele are addicted to his amba.) I like how it added an exotic bite. Then came pickled turnips (bright pink from beets), thinly sliced cucumber and chopped tomato. 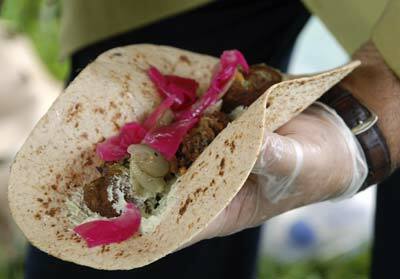 Uniquely flavorful, this style of falafel is lighter than what I’ve tried elsewhere, and was told those particular toppings are quite popular in Israel. Redland Mediterranean Organics has teamed up with Sous Chef 2 Go and is sharing a tent at the Jackson Memorial Hospital farmers market. It happens on Thursdays in front of the Alamo building. Go look for their tent at lunchtime. The arazá ice cream is waiting to meet your taste buds. Also new on the menu is chicken roll — chicken seasoned with sumac (which gives it a cinnamon-like taste), rolled in dough and baked. And don’t forget the goat cheese! Open Thursdays from 9 a.m. to 4 p.m.